The origin of glazing globes can be traced back to 13th century glass blowers in Venice, Italy. 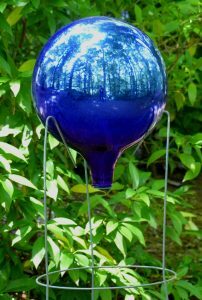 Their peak of popularity is often associated with the grand English gardens of the 19th century Victorian era, but on this side of the Atlantic, gardeners continue to party with gazing globes like it’s 1899! However, there are other ways to display gazing globes—creative curves that can help restore the fun and charm to this old garden favorite. For starters, find a tree. Not just any tree, but an old guardian in the garden that has three or more trunks. 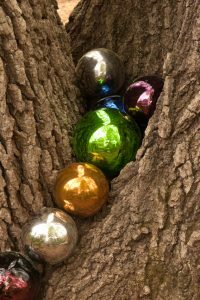 In the cavity at the base, simply nestle a few gazing globes of different sizes and colors to pleasantly surprise passersby. Of course, not every garden is graced with large, stately trees, but there is another trick that can provide a treat in almost any landscape. Buy a round wire tomato cage, turn it upside down and bend the wire prongs inward so they can securely support a gazing globe from its bottom. Next, place the cage in a flowing, flowering bush such as forsythia, shrub rose, spirea, weigela or kerria. Set the gazing globe on the prongs and position it so the sphere is slightly nuzzled into the flowers and foliage from above. This creates a “floater”—a magical bit of mischief that makes gardening fun. And since gazing globes come in various sizes, make use of the smaller spheres by adding them to potted plantings. 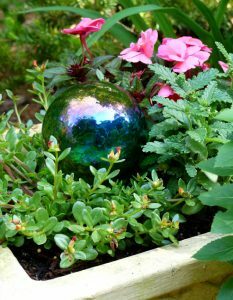 Whether sitting on a short perch or resting in the container’s soil, one or two of these pretties in the round will provide constant color to match the eye appeal of flowers and plants with variegated or colorful foliage. Most gazing globes are either glass or ceramic, so it is not a bad idea to bring them inside by the end of autumn. This not only prevents the fragile spheres from becoming victims of falling branches and temperatures in the winter, but it also provides the opportunity to clean them so their captivating glow will be restored and ready for yet another growing season in the garden.